On Friday night, President Donald Trump issued a heartbreaking, intensely xenophobic executive order that indefinitely blocks immigration of Syrian refugees to the United States, and bans all immigration from seven predominantly Muslim countries (Iraq, Iran, Sudan, Libya, Somalia, Syria and Yemen) for 90 days. The order also suspends immigration of all refugees to the United States for 120 days. At the same time, Trump signed a memorandum on Friday to undertake “a great rebuilding of the armed services,” calling for an increased military budget, the specifics of which have yet to be determined. The ban went into effect immediately, and its consequences—for international relations, for resistance movements, for Muslim communities and communities of all kinds, for families and friends—are now being reckoned with and reported on as they begin unfolding in real time. 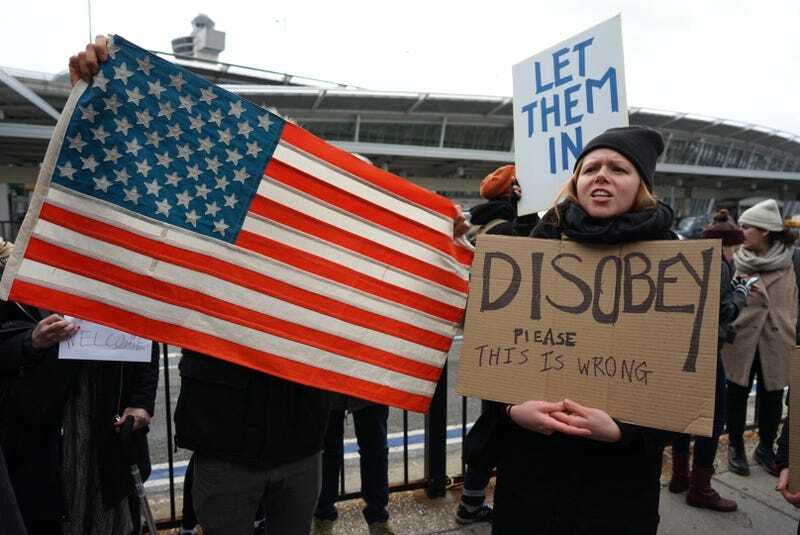 Chaos and confusion are already setting in at airports around the world as passengers are being turned away from international flights to the United States and, in some cases, being detained after just landing in the US and forced to return to their country of origin. The Times’ initial story on the travel ban contains a litany of reports on travelers spurned, humiliated, inconvenienced, and endangered by the ban. A Syrian family of six, for instance, who had been living in a Turkish refugee camp, learned today that their long-awaited flight to Cleveland on Tuesday has been cancelled. The lawyers also filed a motion for class certification to represent all refugees and immigrants being unlawfully detained as a result of Trump’s order. Twelve people were detained overnight at JFK airport alone. Protests at the airport are already underway. The New York Daily News reported on Saturday that one of the travelers detained at JFK—a Chilean woman who, according to a law enforcement source, didn’t want to return to Chile—attempted suicide by downing 30 sleeping pills and some muscle relaxants. Officials told the Daily News that the woman is now in stable condition at Jamaica Hospital. It’s also being reported that Iranian film director Asghar Farhadi, who just this week received an Oscar nomination for his latest film The Salesman, will be banned from attending the awards ceremony in February. This post will be updated as the devastating effects of Trump’s immigration ban continue to take shape. Update, 5:50 PM: Trump’s immigration ban targeting Muslims and refugees is literally called “Protecting the Nation From Foreign Terrorist Entry Into the United States.” This is the stated purpose of the order, yet, as many journalists have pointed out, no one who has emigrated from (or whose parents emigrated from) the seven predominantly Muslim countries singled out for additional immigration restrictions has ties to any killings on US soil deemed “terrorist attacks” since the September 11 attacks. Donald Trump also doesn’t have any ties to these countries, no business ties, at least, though he and his family do have financial interests in several other predominantly Muslim countries not mentioned in the ban—like Egypt, Turkey, and Saudi Arabia. Is this a conflict of interest? With humanity, certainly. With the Constitution, well, Obama’s former ethics advisor Norm Eisen seems to think so. But, you never know, it’s not as if the media is even aware of all the business deals Trump has been involved in over the years—there’s always the chance his tax returns could bail him out. Trump should totally release those.